You are currently browsing the Laurie Klein Art — Laurie's Place blog archives for March, 2011. There is always more going on in an illustration than you might realize. Every drawing tells a story, sometimes more than one, beyond the actual words written on the page. Before pencil ever touches paper there is research – lots of it. Or at least that’s how i approach drawing. Whether it’s a book, a wall mural, a piece of spot art, or a concept sketch i like to have as much reference material as possible, even if the end result is a simple cartoon. I have learned over the course of many years wielding pencil and brush that models or photo references or additional information helps make a picture that much more engaging and entertaining. As well as accurate. Now i’m not the type of illustrator who insists that everything i draw HAS to be educational or teach some great truth or impart some deep meaning – that can get awfully ponderous and stuffy – however i have learned that quite often the information unearthed during the research and reference hunt process takes the drawing in a direction i may not have originally considered. When i was doing the research for the animals featured in “Little Skink’s Tail”, for example, i discovered a wonderful photograph of a skunk literally doing a handstand as one of it’s defensive displays. It never would have dawned on me to draw a skunk in that position, particularly in a realistic setting, but the minute i learned this was a natural behavior i had to include it in the book. It was simply too funny an image to ignore and subsequently made for a delightfully whimsical illustration that also happened to be correct – so the illustration works on two levels: educational and entertaining. … and wound up having more information than i knew what to do with. Or, to be more precise, wound up with more information than i expected. I mean, obviously, i anticipated my research to lead me deeply into the realms of General Science and Astronomy; what i did not expect was to find links to every other art and discipline imaginable. 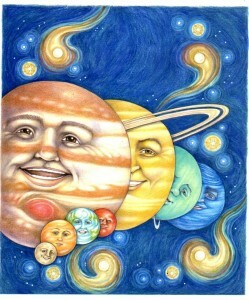 Astrology, Biology, Chemistry, Physics, Math, Philosophy, Literature, History, Mythology, Fine Arts, Pop Culture, Science Fiction, and Music ALL have a connection to the planets in some way. I’m really rather ashamed to admit how much that took me by surprise, but once discovered it had to be shared and i had an absolutely wonderful time finding ways to squish all this amazing information into every page of the book. 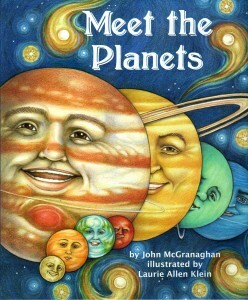 … you have met the planets, now meet all the things going on behind the planets.